You want to learn how to surf? Always been thinking of wanting to ride a wave and enjoy the surfing lifestyle? Then you have are here to learn how to surf here. You want to find a surf school that is going to teach you all about the ocean, the currents, undertows, rips, how to line yourself up with the waves before you paddle up and understand how to learn to read the waves before you paddle out. Just a heads up to learn how to surf you will only find a very small percentage of surf schools worldwide that will give you a wonderful foundation to learn to surf. I can’t tell how very important it is for you to be taught to learn about reading the ocean, her currents and know how to move through them to keep yourself safe. How to paddle out with the least amount of energy spent, so you may have more energy catching waves and paddling back out. You can see rip currents from the beach, because they move on top of the ocean outwardly from the beach, from right to left, left to right depending on the wind and swell direction. 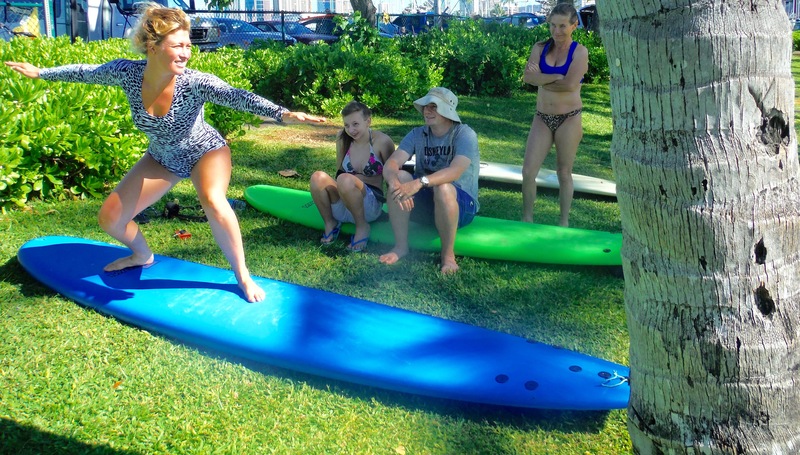 These helpful important factors are so important when you learn how to surf. Undertows you will find inside close to the shore break, which can pull on your legs and body, so its smart to spend at least ten to twenty minutes watching the surf making sure you feel good and comfortable where you plan to paddle out. But it is very wise after you have gone and learn how to surf from a smart surf school that will have a great foundation to surf with people always better than you. Surfing with people better than you will progress your surfing and expand your knowledge each time you surf. Surfing can be a sharp learning curve for some, but the more you go surfing and surf many different surf spots the better you will get. But honestly you need a great foundation and a solid coaching from surfers or a surf school that has the capacity and experience to truly help direct you and your surfing. Another very important factor is not going out and buying a surfboard before you have spoken to a true professional and taken some surfing lessons or a surf clinic. And don’t think people who work in your local surf shop are going to guide you in the best direction. It’s so important for most people to be on a long board at least nine 9’ feet, but if you are over 5’8” to say 5’10” a nine 9’6” six foot surfboard would be better for you. And if you weigh more than 175 lbs or 79 kilos and over 5’10” then make sure you are learn how to surf on at least a 10’ ten foot board and think over 3 ¼” inches thick so you have a stable surfboard. If you are in the larger department like over 6’ foot & 220 lbs or 100 kilo’s make sure you are on a surfboard 10’6” footer. These measurements will make it much easier in the process to learn to surf. Here is a tip for your paddling. You want to prepare with some exercise. The best one is standing up, and do the Freestyle stroke five minutes daily to build up your upper body. You may think Oh No! No problem five minutes that’s nothing. Yeah! Yeah! Just wait you will feel it by the time you get to (2) two minutes, but keep going this will really help you to prepare to learn to surf. Now the most important factor in learning anything in life and when you learn how to surf is relaxing, breathing and not holding on to any tension in your body. If this is hard for you and your body is stiff then it’s smart to take up some Yoga beginner classes to help you breath and be more flexible when you learn to surf. Another important tip is when you grab the rails of your surfboard always grab right below your chest. This makes it much easier to go from a prone position directly up to your standing position. And it helps to land with your feet more than shoulder distance apart, knee’s bent, center of gravity in your waist and hips. And also so important in so many sports to keep your head up and looking forward. Think about it. When you drive, do you look down at your feet, at the dash board or front of the hood of the car? Nope! You are looking out front of you and watch where you are going. This will give you much better balance, focus and speed. So prepare and do your homework to find a great surf school as it will make a huge difference in your learning curve when you learn how to surf. Check out this link and it will give same tips with the visual. After learning about the ocean and waves she caught her first wave and got a really long ride.